On April 19 I heard his familiar “chewink” for the first time this spring. 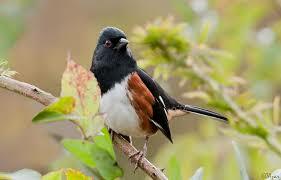 Towhee was back for the season! We live on a woodland edge in the midst of a ravel of understory blueberry, bayberry, huckleberry, checkerberry, green briar, poison ivy and more—a thicket of trouble for us humans but towhee’s natural, sought-after habitat. Return of towhee and other little migrants in the spring is always an anticipated event for me; it marks the end of a tough winter and grounds me in the life-sustaining rhythms of the earth. Like many residents, we have a birdbath, and for 45 years it has been in the same place. It is constructed of two parts—a natural vertical shaft of stone which serves as the base and a hand-made basin of concrete which sits atop the stone. Arcing the bath on the southeast are rhododendrons which have grown huge over time and serve as a favorite avian hideaway, especially after a sip of water and splashy bath before bedtime. I was privileged, by happenstance, to watch towhee on this particular day make straight for the location of the birdbath. The lingering cold this spring had discouraged us from preparing the bath basin so only the stone shaft ‘pedestal’ was there—-no basin, no water—and clearly Towhee was nonplussed. In a heartbeat, he landed on the top of the stone shaft, fluttered up and down a couple of times, even approached the pedestal from several angles to better assess the situation, then flew off. All the while I had the distinct impression he was perplexed at not finding any water, yet certain that he used to get a drink there. How astonishing, I thought, that this little bird, migrating hundreds of miles up and down the east coast through untold hazards, had survived to revisit the exact same birdbath where he had spent an earlier summer or two or three. Heartwarming and amazing—To Towhee, who made my day!